The 8W Dimmable COB LED Bulb in PAR20 size is now available as part of LED Montreal’s high end line. The PAR20 format is very popular for recessed fixtures and is only available with an E27 (screw-in) socket. The COB LED PAR20 Bulb offers a 40 degree beam, making it ideal for directional lighting and is are rated for commercial use either indoors, whether it be in a dry or damp environment or outdoors, in an environment where they would not be directly exposed to water and harsh weather. The compact size of the COB LED Light Bulbs allows them to fit most standard fixtures requiring PAR20 Bulbs. 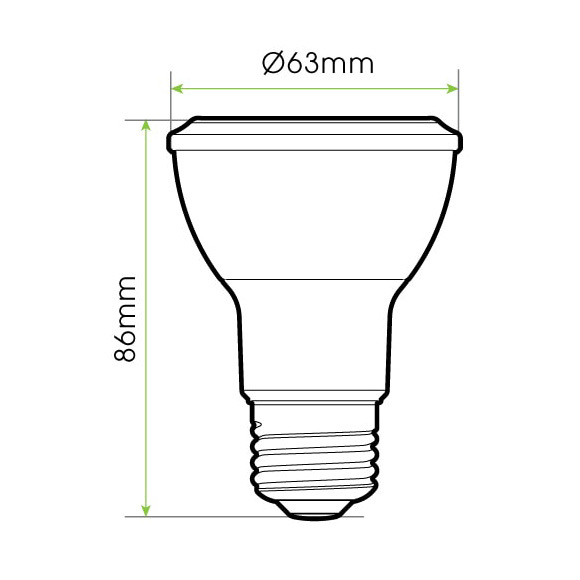 Those high quality COB LED Bulbs are powered by genuine, industry leading Chips. Beware of cheaper LED Light Bulbs that use counterfeit or imitation chips. The COB (Chip On Board) LED technology used in this Bulb makes it amazingly bright while only consuming 8 watts of power. As a matter of fact, it is so efficient that they can be used to replace a standard 50 Watt halogen light. Furthermore, COB LED Lights Bulbs have an expected lifetime of 30 000 hours. Simply put, this LED Bulb will save you up to 85% in energy (vs. a standard 50 watts bulb) while lasting a very, very long time. Now that’s what we call giving you amazing value and quality for your money. The PAR20 COB LED Light Bulb is dimmable from 100% to 10% and is offered to you in Warm 3000K. Warm White is suitable for applications where a standard incandescent or halogen light would be used.